Wedding wine is almost always overlooked as most wedding couples worry more about the wedding venue, the wedding photography and just about everything else. The fact that some banquets throw in complimentary alcohol and wine further compounds the impression that this segment of the wedding checklist has been well taken care of. Like the perennial bridesmaid, wedding wine does not get the attention it deserves. 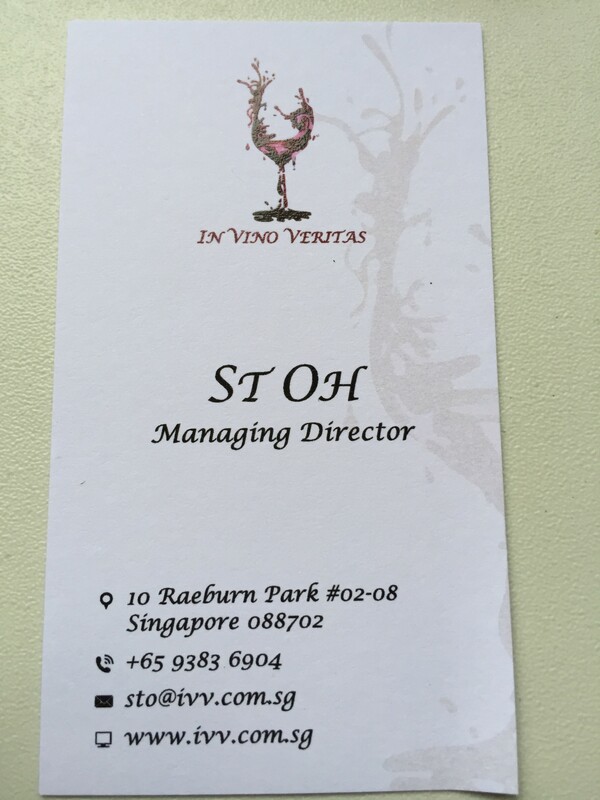 Working overseas and having little time for wedding preparation when in Singapore, Heartland Boy nearly made the same erroneous assumption until he met ST OH, owner of In Vino Veritas, at a friend’s corporate event. Heartland Boy would like to introduce In Vino Veritas, a wine supplier that imports wine wholesale from both the New World and the Old World. It specializes in weddings and corporate functions in Singapore. 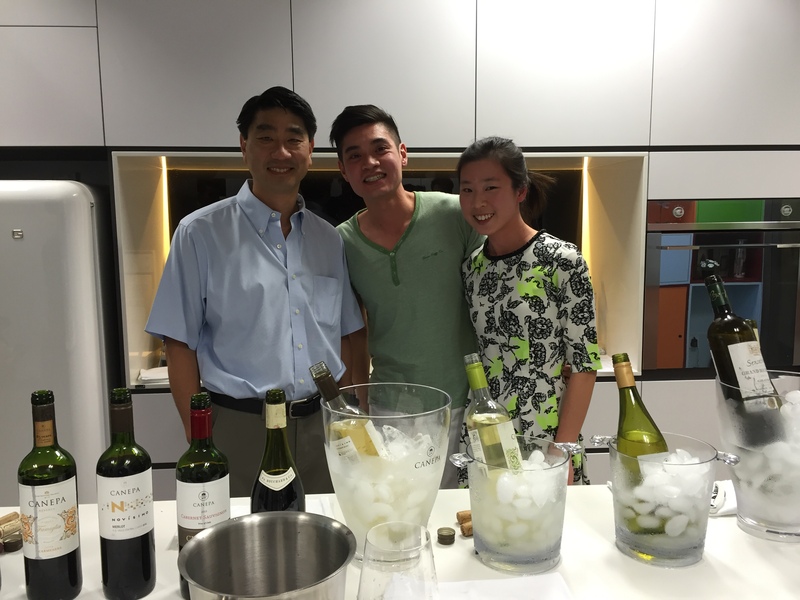 Heartland Boy and Heartland Girl had a truly enjoyable process tasting and choosing our wedding wines with ST and would readily recommend In Vino Veritas as a wine supplier that represents the best value for wedding wine in Singapore! In Vino Veritas offers wedding wine tasting services for the wedding couple. In Vino Veritas charges a mere token amount for exclusive wedding wine tasting services and this amount is reimbursed upon purchase of wedding wines. Heartland Boy cannot stress how important this simple gesture can be. Wine tasting allows the wedding couple to be very certain of and comfortable with the quality of their wedding wines. Choosing a good wedding wine ensures one less worry to have during the wedding. Furthermore, wedding wine tasting services are not available at most wine boutiques and hotels unless the wedding couple is prepared to pay for the cost of the entire wine bottles sampled! In Vino Veritas’s wedding wines are tremendous value for money. To be honest, Heartland Boy and Heartland Girl were taken by surprise when ST showed them the price list after the wedding wine tasting process had ended. The wedding wines ranged from a nett price of $20 to $40, which represent tremendous value for money given the quality of the wedding wines they had just tasted. Definitely cheap wedding wines but with a flavour profile that will satisfy most of your guests at the wedding ceremony! In Vino Veritas is run by ST OH, a charismatic and experienced gentleman who is truly passionate about his wines. Coming from the heartlands, country pumpkins Heartland Boy and Heartland Girl were initially very apprehensive about wine and its associated words such as acidity and tannin etc. However, during the wedding wine tasting process, ST explained patiently the differences between the New World and Old World. When Heartland Boy and Heartland Girl were in a dilemma over which wedding wine to pick, ST would give helpful pointers. For instance, Heartland Boy asked, “Should I order only red wine or only white wine or both? If both, in what proportion should I order my red wine and white wine?” To which ST replied, “You should ALWAYS order both. Some people are just predisposed to a certain variant of wine and it is always good that your guests have a choice. As for the proportion, you should order according to the gender proportion of your guests. Males instinctively reach out for red wine, while females generally go for white wine. If you want to err on the side of caution, order more red wines because males tend to drink more.” Heartland Boy skipped a heartbeat upon hearing such advice garnered from years of experience. The added personal touch helped to demystify wine and also made it a less intimidating environment to try the wedding wine and champagne. 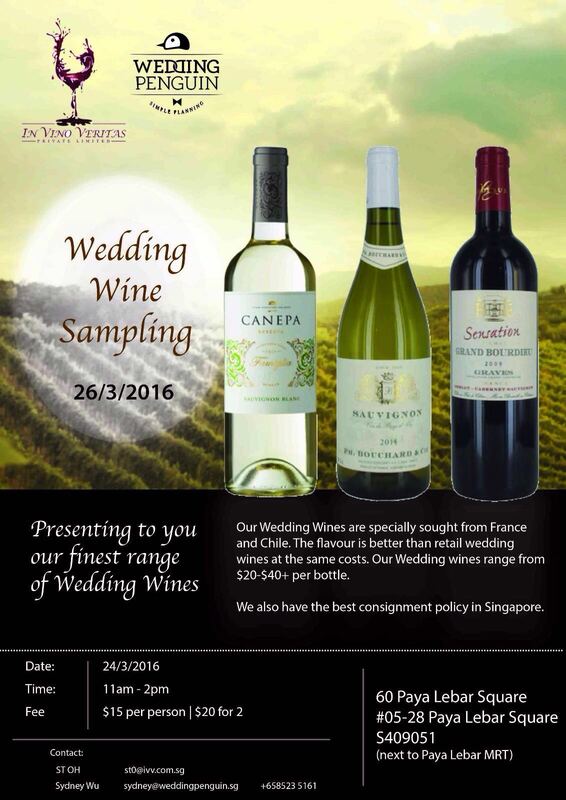 In Vino Veritas is able to supply wedding wine on a consignment basis. Given that it can be quite hard to predict the actual wedding wine consumption, ST allows the wedding couple to order on consignment and would gladly take back the unconsumed bottles at no extra cost so long the labels are not wet. Such an insurance policy ensures the wedding couple does not have to worry about purchasing last-minute pricey wines from the hotels or restaurants. Another added advantage of engaging ST directly is that he is able to make decisions on the spot as the owner of In Vino Veritas. He is flexible in terms of pricing and order quantity as his primary objective is to help take a burden off the couple’s shoulder by ensuring that the wedding guests enjoy the wine. Figure 3: ST OH with Heartland Boy and Heartland Girl. Apologies for the flushed look. Engage In Vino Veritas as early as possible. Because ST is such an experienced hand in his industry, there were occasions whereby he was able to leverage on his network and helped the wedding couple negotiate for more corkage waiver or a lower corkage charge. Book your appointment with In Vino Veritas at least 2 months ahead of your wedding as the popular wedding wines have a fast inventory turnover. Therefore, confirming your orders in advance give ST plenty of buffer time to stock up before your big day! It is best to come prepared. Even sending your banquet menu to In Vino Veritas would be really helpful. ST has wine consultants who are really adept at pairing food with wine. Every little bit of information would be useful. Readers will be pleased to learn that In Vino Veritas may extend special discounts to readers of heartlandboy.com*. Heartland Boy can assure you that you will have one less worry when you order your wedding wine from one of the best wedding wine suppliers in Singapore! Bro this is awesome! U always sniff out all these deals!! These are some really good information about choosing a wedding wine. You pointed out that the wine for the wedding is normally forgotten and it does seem like you shouldn’t do that. It seems like you should find a wine supplier early on that way you can get all the wine you need for your special day and it will be a wine that you like.